Where do the various topics in 1 Corinthians come from? Q. My Sunday school class has just started studying 1 Corinthians. I have your study guide and I agree that the questions Paul addresses are of two sorts, some that were asked in person and some that were asked in a letter (that we do not have today). My question is, what are the clues to do the sorting? Before your book I just thought that the division came about halfway through 1 Corinthians where Paul says, “Now for the matters you wrote about.” I thought that everything after that was addressing the questions from the Corinthians’ letter, and everything before that was addressing the questions delivered in person. But your book does not sort them that way, so I was wondering what clues I might be missing. 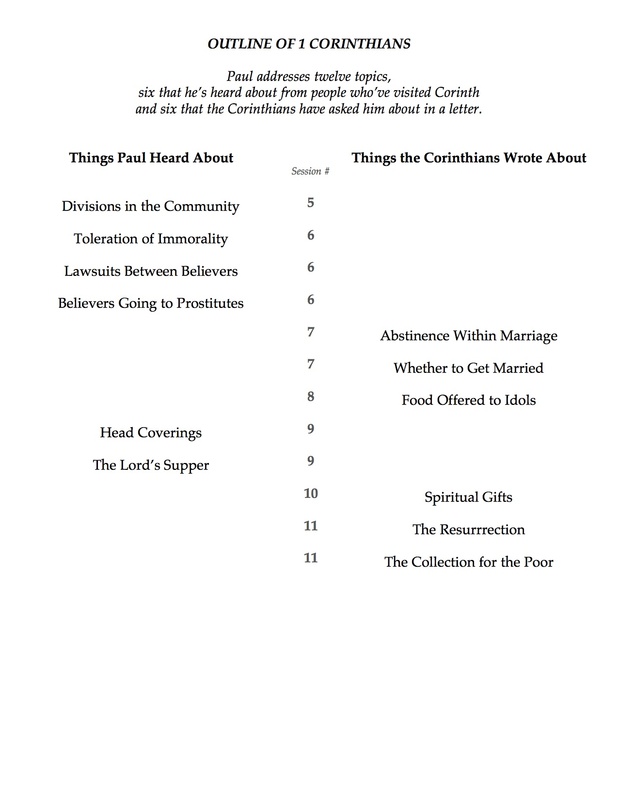 You’ll see that I distinguish between “things Paul heard about” and “things the Corinthians wrote about,” rather than between “things the Corinthians asked about in person” and “things the Corinthians asked about by letter.” This helps account for the way I sort out the material a little bit differently from the way you are used to. I agree that it’s a perfectly straightforward reading of the epistle to understand that starting at the point where Paul says, “Now for the matters you wrote about,” he is answering questions that the Corinthians have asked him by letter. That’s really the only explicit indication he gives of the distinction between where the questions have come from. So why do I feel that two of the topics he addresses after this point (head coverings and the Lord’s Supper) actually aren’t things the Corinthians have asked about? It’s because of the way Paul characteristically introduces topics as he takes them up in the letter. Paul explains when he begins to address his first topic, divisions in the church, that “some from Chloe’s household have informed me that there are quarrels among you.” Paul is in Ephesus, across the Aegean Sea from Corinth, and apparently some servants of a woman named Chloe (presumably a member of the community of Jesus’ followers in Ephesus) have just returned from Corinth with disturbing news of problems in the community there that weren’t mentioned in the recent letter to Paul. So these aren’t so much matters that the Corinthians have asked about verbally via these servants; rather, they are matters that the servants have reported back to Paul. And so Paul also says, as he takes up his next topic, “It is actually reported that there is sexual immorality among you.” And since he does not refer to “the matters you wrote about” until after he has addressed his next two topics, lawsuits within the community and believers going to prostitutes, it appears that these are matters he has heard about from Chloe’s servants as well. As Paul does take up the topics from the Corinthians’ letter, he characteristically introduces each one with a standard formula, peri de, translated “now for” or “now about” in the NIV. This is how he introduces his discussions of abstinence within marriage, whether to get married, food offered to idols, spiritual gifts, and the collection for the poor. Paul does not begin his discussion of the resurrection with this formula, but he nevertheless appears to be responding directly to their questions in what he writes on this topic. These are admittedly subtle indications that are open to different interpretations. Nothing in them absolute rules out the division of material that you’re used to. But if we do take them as cues to where the topics in 1 Corinthians may have come from, they suggest that Paul is actually grouping his material somewhat thematically in places. He ends his opening discussion of things he has “heard about” with a teaching against going to prostitutes, and begins his discussion of the matters the Corinthians “wrote about” with thematically related teachings on sexual relations within marriage. And since the teaching about spiritual gifts has largely to do with their use in worship, he addresses two other topics related to worship, head coverings and the Lord’s Supper, just beforehand, even though they are matters he has presumably “heard about” rather than matters the Corinthians have “written about.” So in my understanding at least, Paul is not strictly dividing the two types of topics into separate sections of his letter. I hope this explanation is helpful. And I wish you all the best as you teach this fascinating letter in your Sunday School class! Previous Previous post: Was Jesus the “angel of the Lord” who warned Joseph? Next Next post: Who were the Nephilim?